There have been numerous times in this blogging adventure when I make sure to mention my ignorance, or as I prefer to call it – my lack of expertise. My lack of expertise really comes out when it comes to French wine. I don’t buy nor drink much French wine because I just don’t have the time to figure out Chateau A vs. Chateau B. But every now and then I give in to the allure of the romance of it all and buy a bottle of Bordeaux. Such was the case a couple of weeks ago during a trip to Jungle Jim’s Supermarket in Cincinnati. 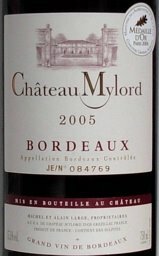 I purchased a 2005 Chateau Mylord wine. Now, for you newbies – with pardons to those who read and know a lot about wine – the 2005 vintage was one the wine world went crazy over. The 2005 vintage is considered to be outstanding. I liked this wine and liked it even more after putting it into a decanter for a good hour. 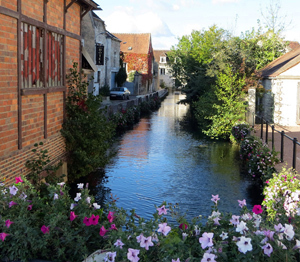 One of the aggravating things about the French, well ONE of them, is you never are quite sure what you’re getting. Most French wines don’t tell you the grape or the percentages of the blend. Bordeaux’s wines are always a blend. I thought this was pretty soft and smooth – after decanting – and felt certain it had a decent amount of Merlot. Goodness, I love it when I’m right! I opened this bottle and enjoyed it Saturday night. I’m just getting around to writing about it. I went online Sunday and discovered this particular Bordeaux is 50 percent Merlot, 25 percent Cabernet Franc, and 25 percent Cab Sauvignon. So 75 percent of the grapes in this one are known as smooth-wine grapes. The wine was ok. And for under $20, it’s probably about as good as you’re going to get from France at that price point. It’s a very dark wine that goes down smooth, there wasn’t much finish to talk about – good or bad. Wine guru Robert Parker gave it an 88. I’m not sure it was that good I just don’t drink enough Bordeaux. But I’d say it’s worth a try if you run across it in a wine store somewhere. Just be sure to let it breathe for an hour before drinking. I do love the stories behind wine and wineries. And the internet usually can track down about any winery in the world. Chateau Mylord was founded in 1763. Michel and Alain Large, father and son, are part of the fifth generation of farmers at Castle Mylord.